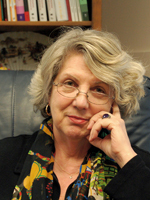 Marsha Linehan, PhD, ABPP, is a Professor of Psychology and adjunct Professor of Psychiatry and Behavioral Sciences at the University of Washington in Seattle and is Director of the Behavioral Research and Therapy Clinics, a research consortium that develops and evaluates treatments for multi-diagnostic, severely disordered, and suicidal populations. Her primary research is in the application of behavioral models to suicidal behaviors, drug abuse, and borderline personality disorder. She is also working to develop effective models for transferring science-based treatments to the clinical community. She is the developer of Dialectical Behavior Therapy (DBT), a treatment originally developed for the treatment of suicidal behaviors and since expanded to treatment of borderline personality disorder and other severe and complex mental disorders involving serious emotion dysregulation. In comparison to all other clinical interventions for suicidal behaviors, DBT is the only treatment that has been shown effective in multiple trials across numerous independent research studies. DBT is effective at reducing suicidal behavior and is cost-effective in comparison to both standard treatment and community treatments delivered by expert therapists. It is currently the gold-standard treatment for borderline personality disorder and has demonstrated utility in the treatment of high substance abuse and eating disorders. Linehan has authored multiple books, including three treatment manuals: Cognitive-Behavioral Treatment for Borderline Personality Disorder, DBT Skills Training Manual (2nd ed. ), and Skills Training Manual for Treating Borderline Personality Disorder. She serves on a number of editorial boards and has published extensively in scientific journals. Linehan is the founder of The Linehan Institute, a non-profit organization which helps advance mental health through support for education, research, and compassionate, scientifically-based treatments. Linehan is also the founder of Behavioral Tech LLC, a DBT training and consulting organization, and founder of Behavioral Tech Research, Inc., a company that develops innovative online and mobile technologies to disseminate science-based behavioral treatments for mental disorders. Linehan was trained in spiritual directions under Gerald May and Tilden Edwards and is a Zen master (Roshi) in both the Sanbo-Kyodan-School under Willigis Jaeger Roshi (Germany) as well as in the Diamond Sangha (USA). She teaches mindfulness via workshops and retreats for health care providers. She has dedicated her life and research to working with people whose lives are at-risk due to crippling and incapacitating psychological problems.